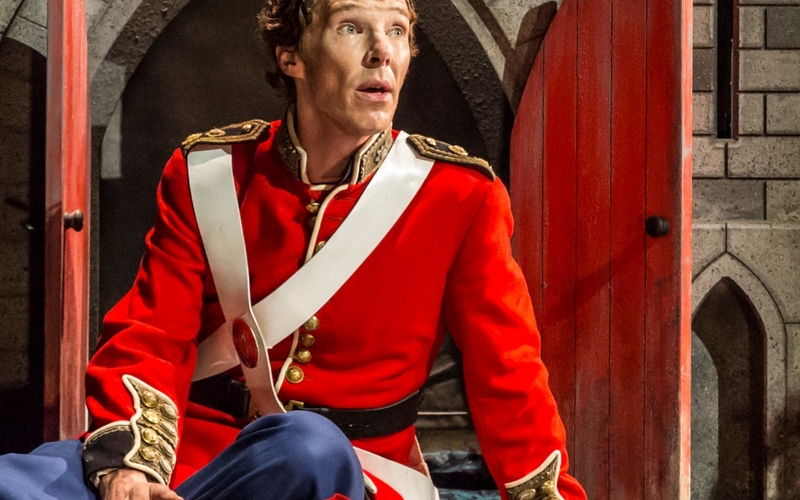 Last Thursday, England’s National Live Theater broadcasted “Hamlet” in cinemas across the globe. The play stared Benedict Cumberbatch and was directed by Lyndsey Turner. As Cumberbatch explained in a pre-production interview, this version of Hamlet was designed to introduce a new (meaning young) audience to Shakespeare’s most famous play. He was right, this was no scholarly approach. Turner is not the first director to approach the play from a modern perspective. Director Michael Almereyda’s 2000 movie “Hamlet” set his work in modern New York with the kingdom moved to the corporate world. Almereyda took great liberty with the play in order to sell it to his young audience. While the movie is not bad, it didn’t do well and fell short of expectations. Turner did not quite make the leap Almereyda did; over all it felt like she was walking a fine line between the pre-modern and modern world. On some level it worked but over all it left some audience members confused. Time in this play was out of joint. The props felt as if we should have been in post WWII, but Ophelia’s modern clothing style and Horatio’s tattoos pulled us forward in time. But let’s not start with what didn’t work, let’s look at what did, for both a student of Shakespeare (me) and my friend to whom this play was aimed. The play begins with Hamlet sitting on a floor in Elsinore listing to a song on a gramophone whose title escapes me, but may be from the 40’s. It was a big band number, something to do with remembering. It is obvious that Hamlet is playing the music because it reminds him of his father. That Turner skipped the opening scene didn’t bother me, but having Hamlet utter both Barnardo and Francisco’s lines, “Who’s there?” “Answer me and unfold yourself” did. Horatio enters and the two engage in the conversation that originally takes place after we are introduced to the court and the first soliloquy. This would be the first of many times Turner omits and replaces both dialog and scenes. While this time it worked for both of us, there were times that the removal of scenes confused us. Cumberbatch’s scenes between Rosencrantz and Guildenstern was theater at its best. Unlike other productions I have seen, the pain of knowing his friends were playing him was heartbreaking. These scenes between the three were haunting, especially given that Hamlet would go on to coldly write their death warrants. At least it worked for me. My friend missed Hamlet’s explanation of what he had done, because the scene was rushed. There was little emotion from Horatio when he heard the news, so it was not surprising she missed it. Despite the occasional confusion and rushed scenes, the play worked well for my friend who was unfamiliar with the plot. At times it had her on the edge of her seat, and she laughed when appropriate. She felt Cumberbatch displayed a wide range of emotion and she bought his heartache and rage. She understood Hamlet to be at his wit ends (no pun intended) by the death of his father and his mother’s hasty remarriage. Yet we both agreed that the Hamlet we saw should have had no problem revenging his father. So here lies the rub, or why it didn’t work. Crazy, or just bad cos play? This Hamlet, though well acted, was not conflicted. In fact, this Hamlet seemed bent on making his new step-father’s life a living hell, not unlike a lot of teens who resent a new parent. His antic disposition was nothing more than a ploy to keep his parents at arms length. The less he had to interact with them the better; so much for trying to figure out if Claudius was guilty of murder or not. Turner cut out most of the scenes between Claudius and Polonius as they tried to figure out what the hell is up with Hamlet. Reynaldo is cut from this production. This makes Hamlet’s crazy disposition seem ludicrous and done only for laughs. By the time we get to the players scene we’ve forgotten why it is that Hamlet is acting crazy. During the players scene Claudius seemed more embarrassed by Hamlet’s stealing of the show when he jumped in and took over as the villain. Did Claudius leave because of guilt or embarrassment? It was hard to tell. As much as I appreciated some of the moments between Hamlet and his friends, there was not enough time devoted to character development or personal connections. When Hamlet confronts his mother, the two actors seem more concerned with their dialog than they do each other. We never felt that moment of clarity when Gertrude realizes the position she has gotten herself into. We aren’t even sure she has such a moment. For all we know she never does. Turner favored visual spectacle over human drama. I would be remiss if I didn’t mention that after Act 3, there is a sudden and very dramatic boom, followed by a hurricane force wind that drives rubble into the castle. This is never explained, though it may have been a metaphor for the splitting of the kingdom. It is never talked about or mentioned by the characters, even as they had to walk on it, and at times, move it aside for clean floor space! It was distracting at best, and at worst, one of the poorest thought out metaphors in the English theater. After all of this, you’d think I would end by telling you I hated the play, but I didn’t. As a live performance piece it was not bad. A few of the actors give stellar performances despite the physical challenges Turner presents them. Yet, this was not, and should not be thought of as a production Hamlet. This was Hamlet lite. Turner’s production captured very little, if any of the emotion and drama that makes Hamlet, Hamlet. Shakespeare lays out the entire human condition for us to discover and experience in this one play, which is why so many actors yearn to be in it. Each word, each scene was written to encompass the human condition, and to lay bare our fears, our desires and how they overwhelm us, to the point that we would take gladly take our own lives or the lives that stood in our way. We thankfully will never do either of these things, yet Shakespeare allows us to acknowledge those hidden emotions that drive our outer behavior. Yet Turner seemed to sweep all that aside for a visual show piece. As if to say live theater can be just as physically and visually entertaining as cinema. If this had been any other play I would have said job well done. But this was supposed to be Hamlet. The audience should have been pulled in because of the dialog, because of the human drama that all of the characters had to face. Instead we witness Cumberbatch rage at everyone, while they in turn did little to hold their own. Even when Gertrude decides to drink from the cup, she does so as if to say she’s had enough of the play, while Claudius is listless in his plea not to do so. I was half expecting him to say, “so much for her”. 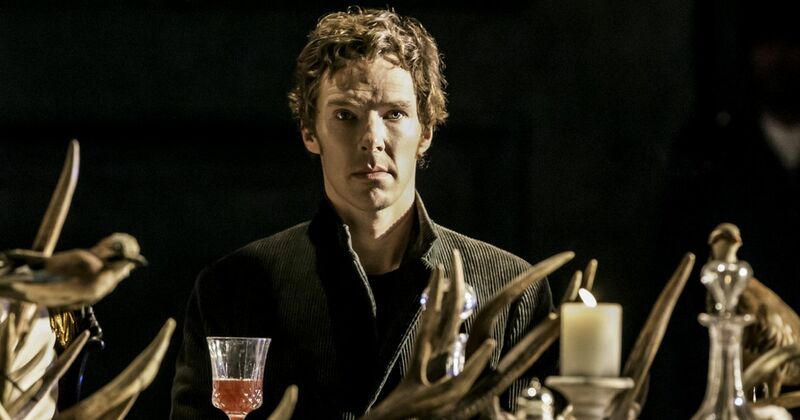 So much is missing from this production that I have to agree with the professional critics when they say Cumberbatch would make a great Hamlet. Too bad this wasn’t it. Great critique, Sari, felt I’d actually seen this production instead of just reading about it.